Last Supper Mouse [DFSLSM] - $1,499.99 : Hollywood History Online, Discover the Magic and Bring Hollywood Home! 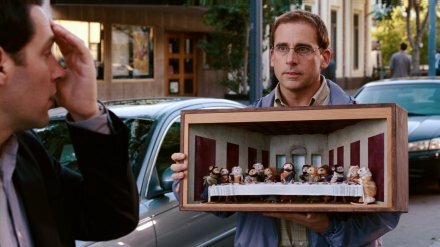 A "Last Supper" Mouse Display from the 2010 Jay Roach comedy, Dinner for Schmucks. In the film, financial executive Tim Conrad (Paul Rudd) must impresses his boss Lance Fender (Bruce Greenwood) at a dinner party where he is required to present a 'schmuck' of his choice, to be ridiculed by the teams financial elite. 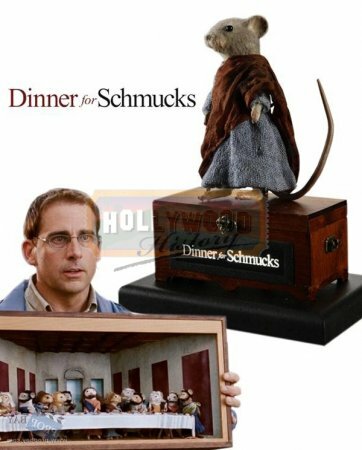 Tim decides to bring along bizarre taxidermist Barry (Steve Carrell) who creates stunning art with dead mice. This particular mouse was made for the Last Supper diorama, however it was unused in the final display. It wears a light blue woven tunic with an amber colored silk shawl worn over the shoulder. Made from fur-covered urethane, the mice in the film were designed and created by the Chiodo brothers, along with a team of talented artisans. This mouse comes presented on a custom made display stand, where it is propped up in a standing position. It stands on a small wooden chest that features the film's title on front, which illuminates by pressing a button in the back. Including the display, this item measures approximately 5.5" x 3.5" x 8" and remains in very good production made condition.